I made home-made non-toxic paint for Audrey other day. As an artist that paints wall murals, I’d love for her to paint too! She’s 9 months now. She puts EVERYTHING in her mouth. I did a bit of reading and found out that even “non-toxic” paint might not be safe for her (and her obsessive hand-mouth habit). Eek! I found this guide – the Art & Safety Guide from the U.S. Consumer Product Safety Commission. It said that, ya, the paint itself may not be the best to use for an infant. But it shocked me that it was mostly the paint pigment that was bad. I was still trying to find a way to add colour to my paint recipe. So I figured I’d just add food colouring. It’s a cheap and quick way to colour paint. There are also concerns over food dye allergies and intolerances. (Article from How Stuff Works). It prob wouldn’t affect Audrey (or even your kids), but if there is a natural route, why not? I used veggies to make my natural paint pigments, so the “food colouring” can be used in baking too! (Another sneaky way to get veggies into food – yippee!). The pigment turned out more pastel than store-bought food colouring – really pretty! I tried two ways to create red and both were with beets. First, I just boiled cubes of beet. The red bled out of the beet so quickly – it looked so pretty in the pot! All you need to do is cut up cubes of beet and cover them in water, bring to a boil for 10 minutes, then turn off the burner and let it sit until they cool. Strain the red water out of the pot into a jar and presto…mix with your paint paste and you’re ready to paint. I did find this way created more of a pink paint than red – still really pretty though! The second option I tried was dehydrating slices of beet then grinding it up into a fine powder. It made a much deeper colour red. Obviously, it took more time. BUT, the powder pigment stays good in the fridge for up to a year, so it might be worth doing a whole batch on a Sunday afternoon that you can use in lots of art projects (and baking). TIP – make sure to grind the powder SUPER fine if you’re planning on using it in baking. I did a batch of pink icing and I saw a few “specks” of red in them. I think if I ground it for a bit longer, it would have been more smooth. But what a great way to sneak some veggies into a sweet treat! Just peel off the outside skin of the beet. Then begin using a vegetable peeler and shred the entire beet into thin slices. If you have a dehydrator at home, it will take about 5 to 6 hours to dry the beet slices. If you don’t have a dehydrator, you can also line a baking sheet with parchment paper and put it into the oven at 170 degrees. That way took me about 3 hours. In either case, make sure the shredded beet is not piled together – no overlapping pieces – and make sure they are not touching each other. They’ll feel completely hard (like potpourri) when they’re done and you won’t be able to bend the pieces. You’ll either need a mortar and pestle or a coffee grinder to grind it. I went with an electric coffee grinder which ground it up into a very fine powder, perfect for mixing into paint or baking. Just boil red cabbage and it gives you a gorgeous shade of purple – really deep and intense. My kitchen smelled like the bog of eternal stench after boiling the cabbage. Roughly chop the cabbage and add it to a pot, just covering the leaves with water. Again, boil for 10 minutes, turn off the burner and let it cool. 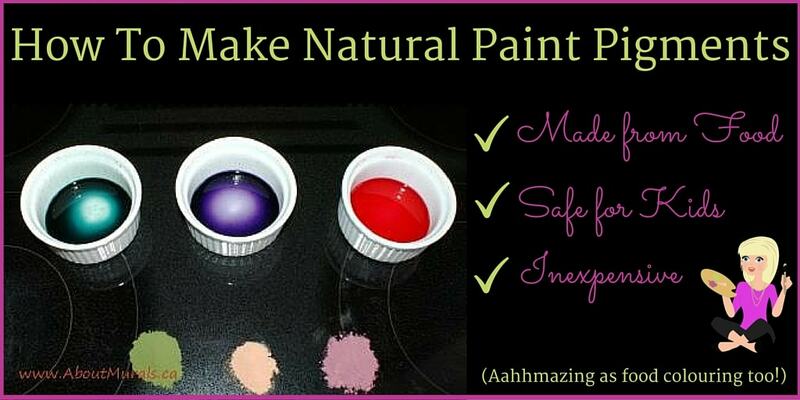 Then just strain the purple water into a jar and mix into your paint mixture. Well, maybe not a true blue, but more of a teal colour. This is the most fun colour to make! I felt like I was back in my high school’s science lab (except I aced this project). Just take some of the purple water (from the red cabbage recipe above), bring it back to a boil and then start adding a bit of baking soda, just a pinch at a time. The liquid will start bubbling up and it turns a deep teal colour as you go. I tried boiling carrots, but it didn’t work great. Not much orange bled out into the water. So I dehydrated shreds of carrot (just like the red beets above) and that worked much better. It’s the exact same method as the beets – dehydrate then grind into a fine powder. It made a subtle, pastel orange colour. Again, I used the same dehydrating method as the beets and carrots, only with spinach leaves. It made a lovely, mossy green colour. I didn’t get around to mixing the yellow or brown paint (I will some day) but I read using turmeric powder (yellow) and cocoa powder (brown) work. If you try them, let me know how they turn out! I know I won’t be using this paint in any of my wall murals, but to get Audrey started on her path to Picasso status, we need to start somewhere. Holding a paint brush and feeling the texture of the goopy paint are both great sensory activities for infants. And making the paint pigment can be fun for older kids too! I’d love to hear how your paint pigment turns out (and see your kid’s art). Let me know how it goes in the comments below. **Disclaimer: my games and activities are not scientifically proven, but are routed in my own research, experiences and explorations. Always supervise your baby while having fun with her. Never allow infants or children to play with items small enough that may be a choking hazard.